As expected, Power Girl's role in the resistance begins in the opening pages as she flies into Metropolis and finds Gold of the Metal Men, who is the last survivor of his team. But soon after arriving, Gold is destroyed too. Power Girl flies away and fights off Brainiac's robots, but then spots Superman's body in the debris below. After a few tear-filled panels, she uses her heat vision to dig into the earth and create a grave for Superman. She also find's Luthor's Kryptonite spear nearby and decides that Dr. Fate can analyze it and find out who delivered the final blow. Power Girl meets back up with Black Canary, August General, Cheetah, Solomon Grundy, Blue Beetle, Mr. Freeze, The Atom and Dr. Fate. Fate reveals the truth that Luthor did indeed strike the killing blow to Superman. Power Girl demands that they seek revenge, but August General insists that their target must be Brainiac. No matter what Luthor did, the crisis at hand outweighs their desire to avenge Superman. Safe in his robot facility, Luthor muses to himself about how he had always wanted to kill Superman because he was keeping humanity from achieving its greatest potential, but that in killing the Man of Steel, he doomed humanity to extinction. Several villains including The Trickster, The Top, Eclipso and Clayface appear and attack the team. But before the melee can get out of hand, Luthor floats in from above and neutralizes the threatening party in a forcefield. Power Girl immediately attacks Lex, but Dr. Fate stops her from killing him. Luthor admits to the group that he made a mistake and honestly wants to help stop Brainiac from destroying the planet. To prove his honestly, he hands a device to Atom that will disable Luthor's armor, but asks that he wait until the threat of Brainiac has been stopped to use it. Dr. Fate confirms that Luthor is telling the truth. After some thought, Power Girl agrees, but specifies that if Luthor steps one toe out of line, she'll rip his armor off herself. The team leaves Luthor alone with the disabled attack force and The Top asks if their plan to make them believe Luthor was on their side had worked. Lex informs them that it worked perfectly and quickly kills them all at once with a green blast from his armor. FLASHBACK to the present where Lois, Perry and Jimmy wake up on the roof of the Daily Planet building and see that the entire foundation has been taken off the Earth and into space. At the Justice League headquarters, Superman proposes that those capable of traveling in space should mount a rescue operation while the remaining heroes save the Earth. Batman suggests that all the heroes will be needed to save Earth and that Superman is simply having an irrationally emotional response about saving his wife over saving the rest of Earth. On his ship, Brainiac muses about how Earth has given him far more trouble than he had often thought, but that now his plans are flawless and any attacks the heroes could mount would be futile. Story - 3: The parts in the future were excellent. It was not clear what great wrong Brainiac did to Luthor as the "next on" tag from last issue promised. Lex's character moments were solid and we know that even though he has something up his sleeve, that Luthor is clearly using his manipulations to save the Earth. Power Girl's reaction to Superman's dead body were amazing. Comic book art without text needs to be at least this powerful to work. It looked similar to the scene when Superman died in "Superman" #75 back in 1992, except that Power Girl replaced Lois in the image where she was holding him and crying. Although it hasn't been directly stated, it's clear that Lois is already dead in this future, possibly from what has been happening in the flashbacks. The death toll continues to rise with this issue. Many heroes and villains died in the opening video sequence that took place before issue #1, but it remains clear that anyone except Luthor could be on the chopping block by the end of the story arc. In this installment, Gold was destroyed, followed by a several villains that Luthor finished off himself. The story in the present is lacking. The previous issues have expanded more on that plotline, while this one simply served as a reminder that it's going on. The only moment of value was when Superman suggested that saving Lois was more important than saving the Earth. Unfortunately, that same moment is the one I hated the most out of the issue. Yes, Superman should be concerned about Lois at this point. But I hate it when he decides it's more important to save her than save everyone on Earth. I simply can't agree that it's something he would do. Art - 4: The locations and backgrounds were excellent throughout the issue. It's clear that the Sun is either rising or setting by the end of the future story, but it's confusing which one it is because of all the dust in the air from buildings being destroyed. It looks great. At one point, the heroes and villains all meet in Metropolis near where the Daily Planet Building must have been because the wrecked globe is in the mid ground. That scene ends with a powerful image of Power Girl threatening to rip off Luthor's armor. She looks incredibly strong and convincing here with the rest of the characters looking at Luthor is shame and disgust. Even Dr. Fate looks disappointed and his mask is static. The flashback scenes look fairly standard by comparison, but the characters, especially the heroes, stand out with their bright colors in a way that the team in the future doesn't. 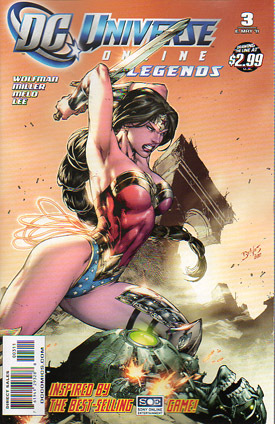 Cover Art - 4: I still love Wonder Woman's look in the game and the comic art. The additional legging armor is unnecessary, but doesn't detract either. This is taken directly from the opening sequence of the game where Wonder Woman takes out Metallo. It was a great moment in the video and this captures that moment in a different, but equally excellent way. 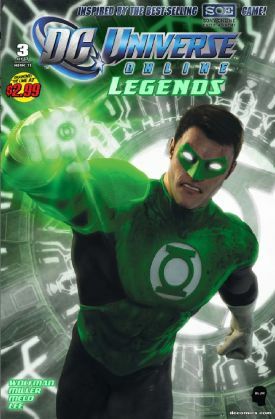 Cover Art (Digital Edition) - 2: I already don't care for how Hal Jordan looks in the game. I have no idea what the background is supposed to represent or if it's even in the game. I don't mind that they didn't jump straight into using Batman, but as the third hero mentor in the game, it would have made much more sense to use him on this cover.